If you want to use MySQL as a data source for your RES software you might encounter some difficulties connecting to the database (Data source name not found and no default driver specified). The database requirements clearly state you need to install the MySQL ODBC Driver, but which version or architecture you need is not mentioned. Here’s a quick overview of the required drivers. In this example I’ve tested with the 64-bit version of the relay server of RES Workspace Manager. 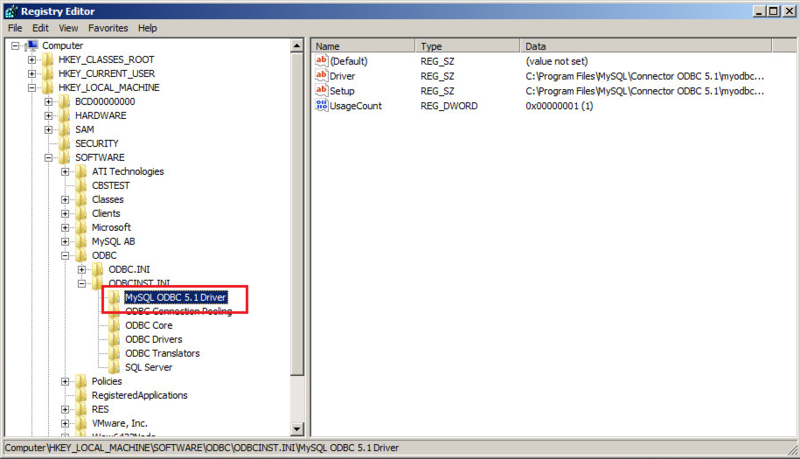 If you run an 32-bit application the driver is located in the HKLM\SOFTWARE\Wow6432Node\ODBC\ODBCINST.INI registry key. Depending on the software component you’re running you need the x86 or the x64 ODBC driver. Some products work with the latest available version (5.2.4 at the moment of writing while other only work with the 5.1 version. Below you will find a table with the tested versions. Update 25-4-2013: Ben Dalmeijer informed me that only the ANSI version of the 5.2.4 ODBC driver is supported. As you can see the 5.1.12 version works for all products.